Okore and Clark forged a resilient central defensive pairing in Villa's 1-0 Premier League victory at Crystal Palace on Tuesday night. The makeshift duo battled manfully amid the continued absence of long-term injury trio Ron Vlaar, Philippe Senderos and Nathan Baker. Lambert hailed Okore for adapting quickly after his return from 14 months battling knee ligament trouble, admitting hopes the 22-year-old can continue to thrive alongside Clark. "Our defensive effort was terrific at Selhurst Park," said Lambert. "Okore and Clark worked very well together, Alan Hutton was outstanding too, and with (Brad) Guzan and (Aly) Cissokho formed a strong unit there. "For Okore it's his third game in quick succession, and he's been out for more than a year. "And I think Ciaran Clark certainly: the two of them have certainly stepped up their game. "That's the aim of football, to have selection conundrums, and those two are going to give me that when others return. "You've got to push a mate to get into a side, and at the minute these two lads are holding their own." Holland defender and Villa captain Vlaar remains sidelined with calf trouble, while former Arsenal man Senderos is fighting a shin problem. Baker is out with a knee injury, and Villa boss Lambert is still awaiting return dates for all three. Former England midfielder Joe Cole joined Villa's walking wounded on Tuesday, limping out after just 20 minutes with hamstring trouble. 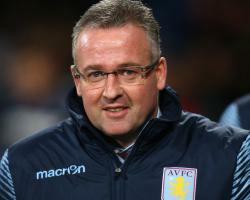 Lambert's men host Leicester at Villa Park on Saturday, with the Scottish boss admitting Cole is a doubt. Former Borussia Dortmund and Scotland midfielder Lambert admitted he will continue to stave off the stress of top-flight management, aiming to hide his relief after Villa ended their nine-match winless streak. "It's a blow (Cole's injury) because I thought he was outstanding in our 1-1 draw at Burnley," said Lambert. "I'll handle this the same as I always do, I don't change. "You try to keep your level, try not to have any stress, which is a hard thing to do. "So I'll just keep focused and try to do my best for this football club, and that's why I'm here. "I know you'll say nine games without winning, but in the last four games we've not been beaten. "So it's whatever way you want to perceive it, and I tend to look at the positive. "I'm delighted for the lads, because they've come through a period where people were giving them criticism, and as I've said before this is Aston Villa Football Club; it's big news. "I'm delighted for them: they've earned their plaudits."